Translation: Aya shomuraPlease introduce yourself and your activity. Hi! 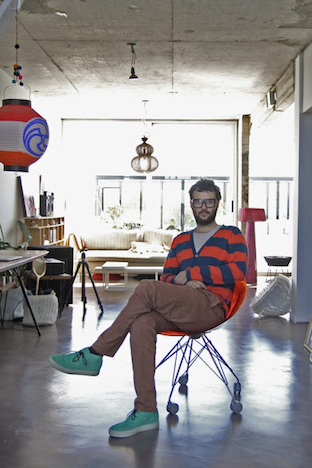 I am Patricio Lix Klett, half craftman, half designer, I think in one way or another. I have my moments; I built my life around designing and manufacturing thoughts & problems that come to me. I enjoy this! I am happy. For the last 11 years my wife and I, worked developing the idea of La Feliz, our company. We design and produce house equipment, store – showroom, trying to develop our own technics to develop our own way of understanding the world. I love freedom, I haven’t felt in anyplace in the world the freedom I feel in BSAS. It is a mixture of anarchism, and low quality institution control. I don’t have an Argentinean word to describe it, is more like a feeling of mine that makes me love living here. How do you feel about design in Buenos Aires? Every culture is unique, the borders of each country define a macro personality, which shape us as consumers, and make our profession having a distinctive point of view. It is in the identity of the material itself where the language of Argentinean designers is, including myself; I have been exploring the materials for the last 10 years. My designing has been growing and reaching inner and outside markets, while still keeping the ‘underground’ essence, avoiding the mass production. I enjoy the city by bike. Many streets have the so-called “bicicendas”, (part of the road exclusively for bikes). The one I prefer is the one that goes along Gorriti street, it allows me travel through coffees, restaurants and beer joint. Gorriti takes me to “Nola” (4389 Gorriti) for a beer, to mexican tacos “La Fábrica del Taco” (5062 Gorriti), to my bicycle shop “Muvin” (5051 Gorriti), to my cousin’s house and it also takes me back home. The area I enjoy is the newest and widest available space, where you can cycle near the river, see the architecture university and travel 25km until “El puerto de frutos en el Tigre” (1648 Tigre), which is the door to our wilderness: The Paraná Delta, which has an overall basin area of 14,000 sq kilometers, and runs for 320 km between the cities of Santa Fe and Rosario and Tigre and it is just 25 km away from the city center. These are things I really enjoyed from my city.